Easter Brunch, Sunday, April 21. Three seating times available: 10 a.m., noon, and 2 p.m. Download the menu and other details. Call 720-898-7350 for reservations. 145th Kentucky Derby, Saturday, May 4. Special menu, drink specials, gift card drawing. 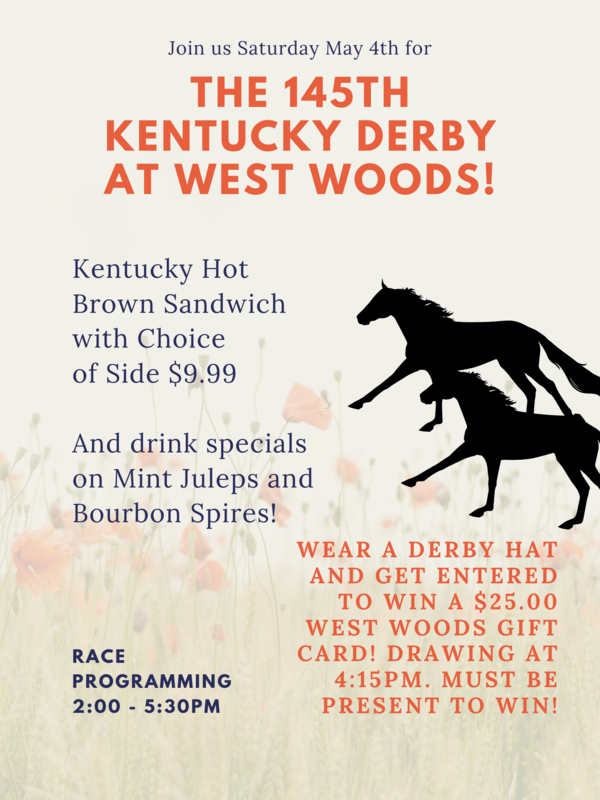 Race programming: 2 - 5:30 p.m. Download the menu and other details. 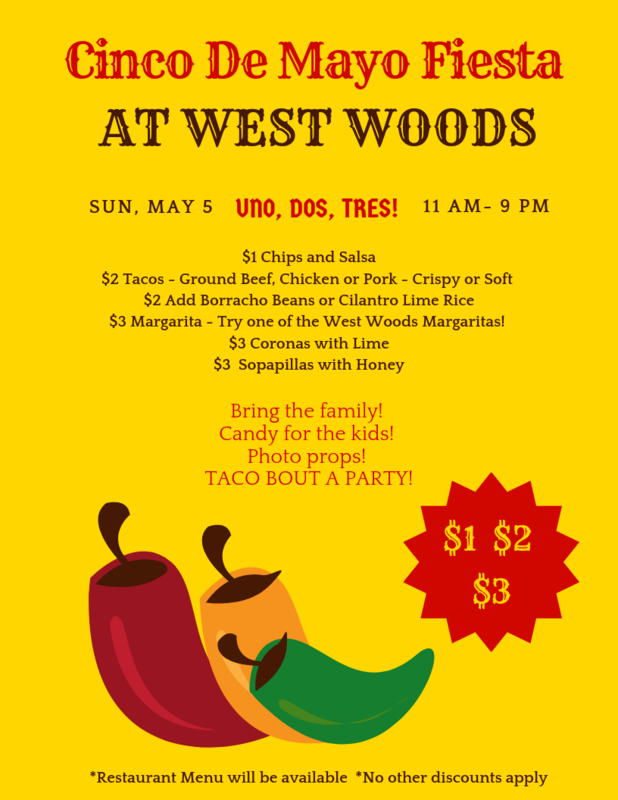 Cinco De Mayo Fiesta, Sunday, May 5: Specials on food, drinks, candy for the kids, photo props. 11 a.m. - 9 p.m. Download the menu and other details. 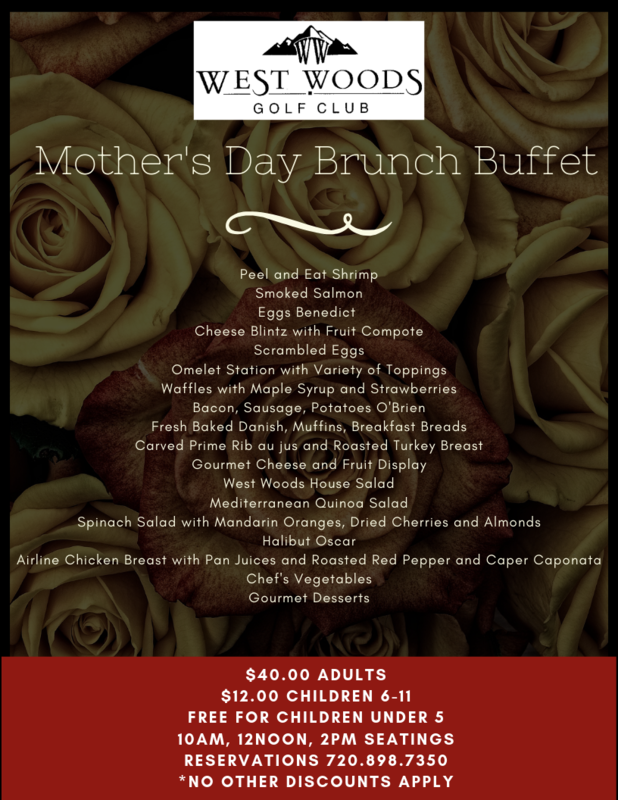 Mother's Day Brunch, Sunday, May 12: Three seating times available: 10 a.m., noon, and 2 p.m. Download the menu and other details. Call 720-898-7350 for reservations. Additionally, the club boasts a Golf Simulator, where golfers can challenge their friends on famous courses in the world of golf, as well as improve their game with training from the golf professionals. 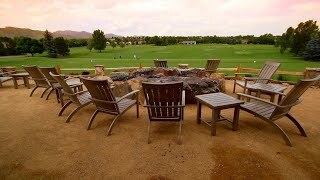 Located in west Arvada, Colorado, West Woods Golf Club features 27 unique championship golf holes. Each of our three nines provides brilliant natural scenery along with challenges for golfers of all skill levels. Play classic golf on any of our three different 18 hole course combinations. Each nine has a very different personality so you will want to try them all. We change the course combinations daily.